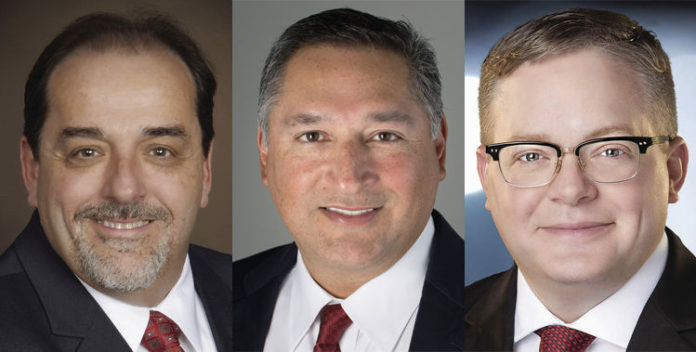 McALLEN — As Saturday’s District 1 special election nears, businessman and candidate Timothy Wilkins has filed a complaint with the city attorney’s office alleging that another hopeful received an illegal campaign contribution. The complaint involves a $10,000 contribution that candidate Joseph M. Caporusso received from the Border Health PAC. Wilkins contends this violated a city cap on political contributions. While Wilkins called this a “major violation” in his complaint, City Attorney Kevin Pagan reads the ordinance differently, but said there’s room for a grammatical argument. The third candidate, attorney Javier Villalobos, raised concerns about the PAC contribution as well, but did not file a complaint with the city attorney’s office, Pagan said. Caporusso, who is a partner at Doctors Hospital at Renaissance, said his interpretation of the ordinance suggests he is not in violation. The political campaign contribution and expenditure limitations section of the city ordinance reads: “No person, other than a spouse, son, daughter or parent of the political candidate, or political committee shall make a political contribution to a candidate for election to the office of mayor or city commissioner of the city of McAllen in excess of $10,000 for office of mayor for a regular election and $5,000 for any runoff election and in excess of $5,000 for any commissioner office for a regular election and $2,500 for any runoff election. When this ordinance was drafted and passed into law in 2006, Pagan was deputy city attorney, Mayor Jim Darling was city attorney and District 1 Commissioner Richard Cortez, whose bid for Hidalgo County judge triggered this special election, was mayor. Prisylla Ann Jasso, executive director of the Border Health PAC, disputed any wrongdoing in the PAC’s contribution to Caporusso. “Border Health PAC, operating by all state and federal rules and regulations, does not believe we are in violation of a campaign contribution, according to McAllen city and campaign ordinance,” Jasso wrote in a statement.